I've been playing a bit of League of Legends lately, I guess the competitive mood has taken over for the time being. Currently, I'm midway through level 21 and inching closer to the cap of 30. Even with XP boosts, it is quite a climb. Nearly all of my time has been playing a support Champion, Soraka. She is pretty much the heal bot Champion of LoL. I have 3 heals, 1 mana heal, and and 1 silence. 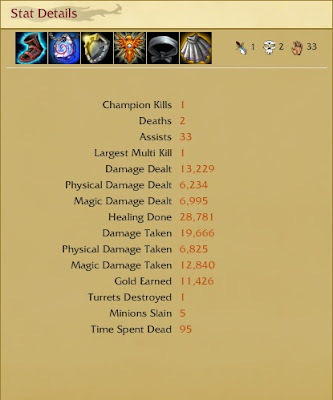 Not many people fear an offensive Soraka, but it has happened. My job is really just to keep my lane mate alive and fed, then try to keep my team alive and silence people when I can. It's pretty relaxing. I ended up having a good weekend in LoL. Twice I had players want me to play with them the next game. Here is a screenshot from one of my games yesterday. I think it went pretty well. By the end of the match, I was pretty much a tank. As much as I like Soraka, I really need to branch out into other support characters. If I ever do get to ranked matches, there is a chance Soraka will either be picked by someone else or banned. in that case, I need a backup. The problem is, I really dislike the theme of the other support Characters. Sona, Janna and Taric to be precise. Alistar isn't too bad, I just don't really like melee support. If only Riot would make a support Champion that was kind of cool. I may have to just bite the bullet and play some Sona though, she seems pretty powerful.